I bought my shea butter and coconut oil from a beauty seller on Ebay. The Beeswax came from the nice people at Sheffield Honey who had just filtered some beauty grade wax. I half filled a large saucepan with water and brought it to the boil. I then put the shea butter and coconut oil in an old large jar that I'd washed out and left them to melt. The wax came in blocks so I chopped it as small as I could and put them in another jar to melt, stirring with skewers every so often. Once both the jars were filled with melted goo poured them both into the larger of the jars to mix. The mixed liquids were then poured into the silicone moulds and left in the fridge to harden. Once they were hardened they just popped out of the moulds to be packaged. 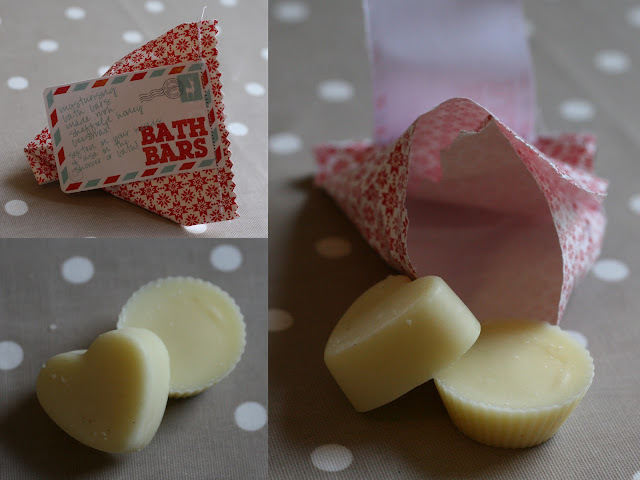 I then made some little paper bags like this and popped a couple of bath bars in it and sewed up the top with a little label on it. The red and blue labels were made using these labels as a base from Eat Drink Chic.